When it comes to nutrition & wellness, many people want to know the answer to one question: "Where do I start?" We're bombarded with diet and nutrition information everyday; from social media to television and even other people's opinions. The "resources" are seemingly endless. This can make it hard to determine where we can find dependable, authentic information. So, as a bit of a "jump-start" guide, I've put together a short list of my most-used, reliable resources for wellness, nutrition and healthy living. 1. The Omnivore's Dilemma by Michael Pollan. A great place to start! Pollan simplifies eating and dieting habits in a way that, I feel, is essential to developing healthy, practical eating habits. The food industry and fad diets can make maintaining a healthy diet, based on simple nutrition, feel like a daunting task. Pollan highlights the importance of eating simply and carefully. Bonus: He created a young readers edition of the book which includes quick food charts & references. 2. Goop.com. I must say, I initially fell in love with Gwyneth Paltrow's Goop because of its beautiful branding and gorgeous social media posts. However, when I dug deeper, I found that Goop.com is actually a great resource for nutrition and lifestyle information. My most-visited tabs are "Detox" (where you'll find the basics of detoxing, including how to properly detox your body using detoxifying foods) and "Recipes" (tons of yummy, healthy options). 3. WHOLE. 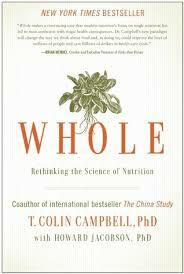 In Whole, T. Colin Campbell, PhD. explains the science behind (the benefits of) eating a plant-based diet. This book also explains the basic composition of foods and how their constitution (as well as chemical reactions with other foods within the body), can impact overall health. 4. MIndBodyGreen.com. MBG's focus is holistic wellness, grounded in mindfulness. Much of MindBodyGreen's content covers the healing properties of food as well as the connection between mind and body health. The site features work from many of today's thought leaders in wellness and touches on a variety of topics including relationships, lifestyle, beauty and more. What are your go-to health, nutrition and wellness resources? Comment below!